In this infographic you can find some really interesting facts about eggs. So.. Large is "normal". I would have thought that Medium was "normal". I’m thinking Medium = Average = Normal. But maybe that’s just me. Perhaps it is a marketing thing. "If we call the normal sized eggs ‘Large’, people will think they are getting more." Here’s just a quick note to my future self (other people are free to take part of it too though). When using the * character to unzip several files using the unzip command on a Mac, the * has to be escaped as unzip wants to do its file listing by itself, rather than having bash do it for it. So instead of writing unzip *.zip, you would write \*.zip. Interesting article on using "market share" as a measurement of success. lifehacker: Dropping the Drip: How to Get Started Making Better Coffee. I just received this link to an article in the Swedish version of Tech World. As soon as I see a reference to pocket protectors, I get suspicious of the article just being a translation (as pocket protectors are not as iconic in Sweden). One google later, I find the previous versions of the article. First published in January, and then in April. The images in the Swedish article are from the April slide show version. Now I can’t find anything wrong with a publisher translating its content and re-publishing it, but as a reader, I feel deceived. Can’t they just tell the readers that they are getting translated international content? With the web, this becomes so much obvious compared to the magazine age. 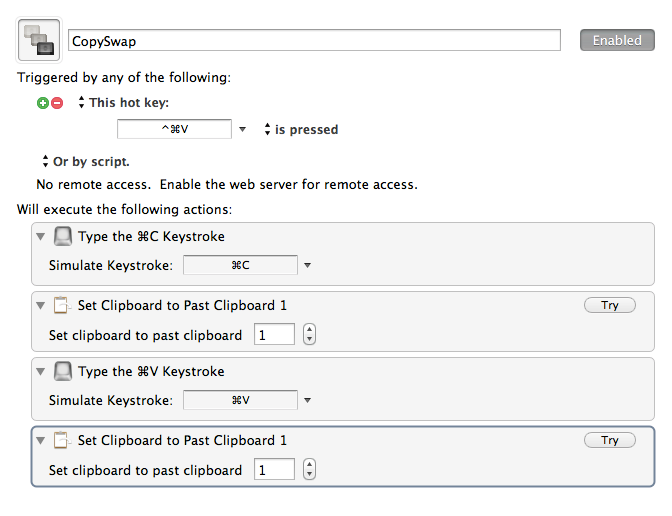 Here is my Keyboard Maestro macro which lets me swap selected text with the text in my clipboard (previously copied).